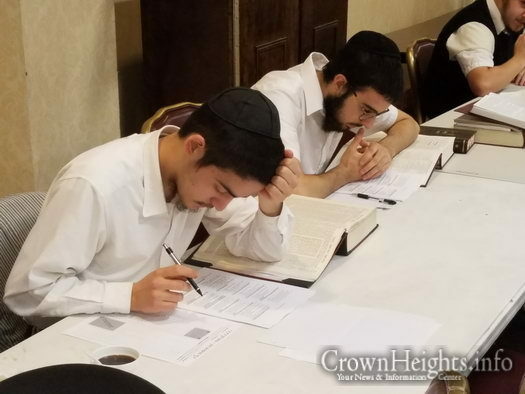 This past Sunday, close to 40 Bochurim were tested on the entire Mesechta Kesuvos at Yeshivas Tomchei Tmimim in Morristown. Mesachta Kesuvos is known as Shaas Koton, and the Shlissel to the entire Shas, being that many key sugyos and topics are discussed. These Bochurim were required to demonstrate mastery of the entire Mesechta, as they were probed on the entire range of sugyos from beginning to end. Sunday’s event gave them due recognition for their impressive accomplishment. 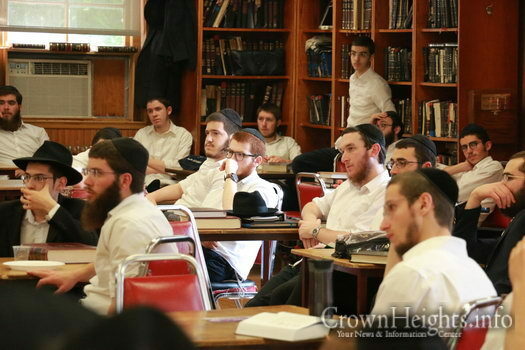 In addition to the outstanding learning of Gemara, there was also a special mivtza to learn all 53 Prokim of Likutei Amorim in Tanya – B’iyun – l’iluy Nishmas Rabbi Meilech Zwiebel, AH. With written tests on every 5 Perokim, 45 bochurim completed the entire Tanya, while many others finished a large number of Perokim. 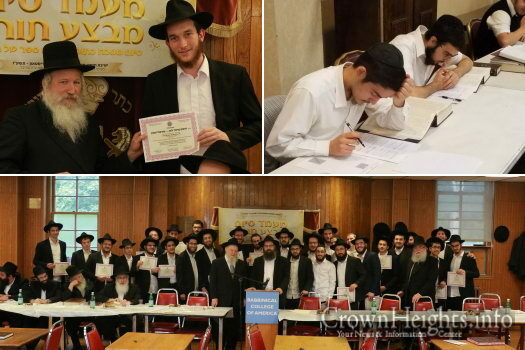 Many Bochurim expressed their appreciation for the mivtza, relating how the campaign gave them an exceptional geshmack in learning Chassidus and specifically in Tanya. Both of these initiatives brought a tremendous atmosphere of Limud hatorah throughout every waking moment in the Yeshiva. 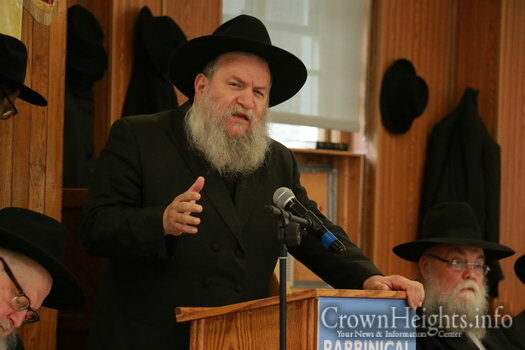 The Menahel, Rabbi Chaim Schapiro opened the event by reading a letter of the Rebbe to graduating students of Cheder Lubavitch in Morristown in 5751. The Rebbe stressed that a graduation is not so much about completing a level, as it is about moving on to the next and higher level. 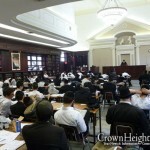 Rabbi Schapiro encouraged the Bochurim to continue going Mechayil el Choyil in their Limud Hatorah. Rabbi Moshe Herson, Dean of the Rabbinical College of America and Shliach Roshi in the State of New Jersey, shared divrei chizuk about the bochurim’s remarkable achievements. 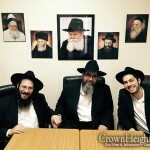 Rabbi Herson personally attended the farher and witnessed the bochurim’s clarity and eruditon. 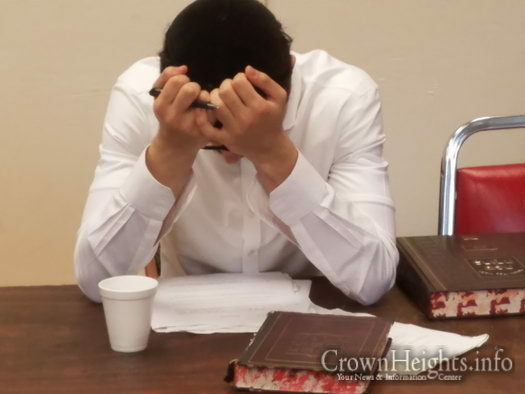 Rabbi Herson shared that he was inspired by the Bochurim’s outstanding performance, and stressed the importance of going beyond the initial learning to review again and again so that the Torah becomes part and parcel of your life. In this vein, he offered a monetary incentive for those talmidim who will again Chazer the Mesechta for a second time and complete it by Rosh Hashono. This gift will be in addition to the large awards distributed at the event. Guest Speaker, Rabbi Zushe Winner, Rosh Yeshiva of Chovevei Torah and Chaver Vaad Raabonei Lubavitch, reflected on what it means to be a Tomim. He encouraged the Bochurim to continue their motivated commitment and hard work in every area of their lives. 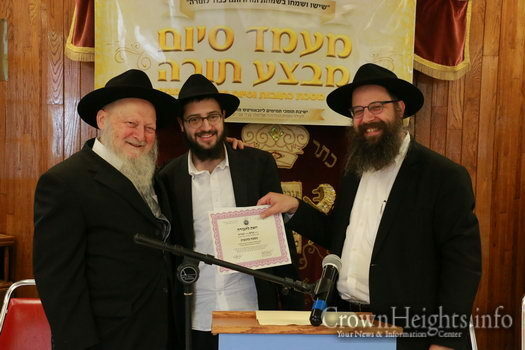 Hatomim Yonason Brown of Minnesota made the Siyum on the entire Mesechta, representing the 50 Bochurim who started the Mivtza at the beginning of the year. The celebration then shifted its focus to excellence in the study of Halacha. 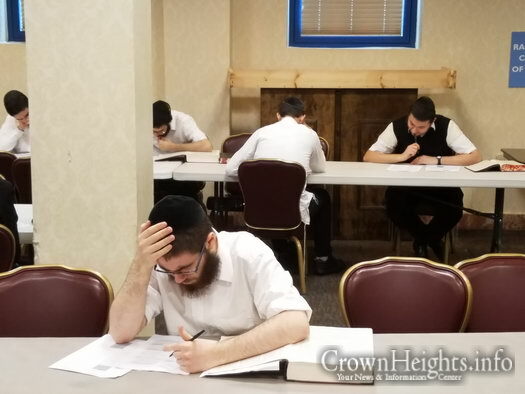 This year, Rabbi Aron Dovid Gancz, one of the principal Roshei Yeshiva in Morristown, piloted an advanced Halocho program designed to help bochurim learn the flow of Halocho starting from the Gemara, Tur, Beis Yosef and Noseh Keilim until the Halocho Lmaseh in the Alter Rebbe’s Shulchan Auruch. Some 20 selected talmidim participated in this voluntary track this year. Rabbi Gancz acknowledged the Bochurim who joined and depicted the pride a Bochur should feel at a moment like this. 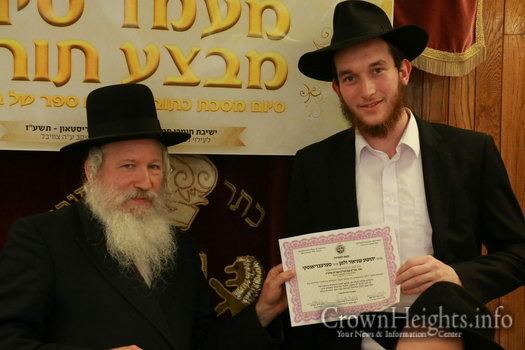 Hashliach Mendy Zilberberg distributed certificates and prizes to those who completed all 53 Perokim in Tanya. Special gratitude was given to this year’s Shluchim in Yeshiva, Hatmimim Mendy Zilberberg, Menachem Wolf, Mendy Wolf and Kuti Radziner. Their dedication to this program made it the marvelous success it was. Throughout the program, thousands of dollars in cash prizes were distributed to the Bochurim who participated in the various areas of this Mivtza. A uniquely festive spirit, and a confident feeling of empowerment for the future, permeated the room as the program drew to a close.